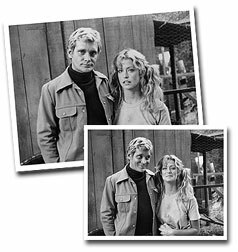 Bo Hopkins history runs deep with Charlie's Angels. 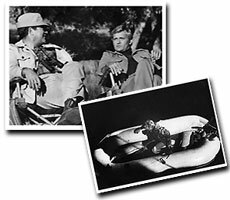 Not only he was one of the few lucky actors to be on the series pilot, he was also on the very first episode when Shelley Hack took her first angel flight. But he's luck does not stop there, he was also romantically linked to two angels and he even meet his wife on the set of Charlie's Angels during the filming of Love Boat Angels. Do you remember the first time you meet the angels??? When I did the Charlie's Angels pilot, I known Kate, I had known Farrah and the only one I didn't know was Jackie and then we became friends. What was your reaction when you read the pilot script? I thought it was different, for that particular time because they had Mod Squad. The premise was different, I didn't think it was bad, but I don't know if it was going to be good. I had a friend of mine Grant Owens, who played the other henchmen, he was one of my best friends so it was fun working with him. Where the Angels Clothes a big ordeal? 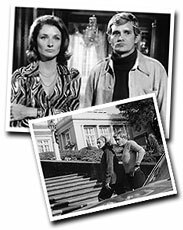 In the morning I would come in and laugh with Diana Muldaur, we would listen to the wardrobe people, and the they [Angels] would say "I want to wear that" and "But I had this on somewhere the other day" -- I laughed and said "this will never go" -- they will never get the clothes right! Anything funny thing happen on the set? During the boat scene, I'm trying to get into position and I went way out and turned around to come back and the motor stopped. So they had to get a boat and come out and get me and drag me in. When we threw the body into the water, we couldn't pick it up so everyone started laughing because it was heavier than we thought. And we almost turned over three times and then finally they had to take some of the stuff out of the "body"
Did hair & makeup hold up the set. The angels had to be there real early and I liked it because I didn't have to come until later. I would have late calls until they got the girls ready. I think David (Doyle) and I both enjoyed that. What about working with Farrah? I heard you dated some Angels. Yeah, I did The Rookies with Kate as a guest star and we dated a couple of times and then later on. 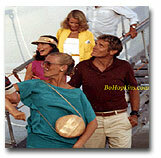 Jackie and I also dated a couple of times, it was later on about the time I did the "Love Boat Angels" episode. Tell me little about Love Boat Angels? It was Shelley Hack's first show. We filmed it in St. Thomas which is beautiful. That was one of the best locations I have been on. I had my friend who was a stunt double and stand in we'd go diving any time we could. We had a great old time. 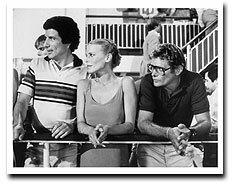 Anything funny on the set of LOVE BOAT ANGELS? It was funny because at that time, Jackie had just married Dennis Cole. I would tease her all the time "Jackie they're not going to cover up that pimple?" "Bo, WHAT... what pimple?" I would drive her crazy. Jackie & I had dated before and so we would laugh about that. One day we where filming out on the beach and all of the sudden this boat comes flying up and Jackie looked at me and said "That looks like Dennis, Bo" and I said "I think it is". Dennis jumps off the boat to make a grand entrance and comes running to her and steps right onto an sea urchin and has to be take to the hospital. I mean that is a great entrance. ©2005 CharliesAngels.com All Rights Reserved. 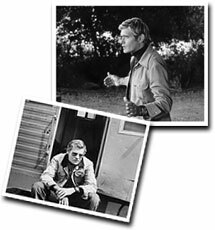 Photos Courtesy of Bo Hopkins Private Collection. All Rights Reserved.